"I am very glad that we found you on the internet. The contractors we found all had different opinions as to the size of furnace we needed. We weeded out those that said we didn't need a manual J done, and hired a contractor to install a Lennox 90,000 btu furnace, as per your calculations. The system works great! Thank you. I will tell my friends to use your company." "We used your service for a full heating and air conditioning design for our new home. Our contractor sized the equipment as per your calculations, and we insisted that he size and install the ducting as per your designs. SUCCESS! The heating system works well. We can't wait to see how the air conditioner performs. Thanks for the time you put into our project. Our services include hvac design for Architects, Builders, Home Owners, HVAC Contractors and Suppliers, and the discerning Do-It-Yourselfer. A Manual J calculation, a Manual D duct design, and a gas line schematic may be a code requirement, depending upon where you live. Most of the municipalities around Salt Lake City (our base) have begun to require these before a building permit will be issued. They also may require some additional forms accompany your permit application to justify the calculations. Residential Manual J calculation prepared with Wrightsoft Right J Universal software. Click here for Manual J examples. Residential Manual D duct design prepared with Wrightsoft Right D.
Block calculations which look mainly at the envelope of your home to determine system equipment sizing. This is an economical quick look at your residence, especially helpful for furnace replacements, air conditioner replacements and add-ons. Our Manual J and Manual D reports such as construction components, delivery requirements of both heating and air conditioning systems, zoning, single and multiple system summaries. Easy to read and follow duct layout drawings. We have performed hvac design calculations for projects in Park City, Utah and Salt Lake City, Utah amongst hundreds of other Utah cities, Denver, Colorado and other Colorado cities, Wyoming, Nevada, Arizona, Idaho, Montana, Florida, New Jersey, Virginia, Washington State, Maine, California, Georgia, Nashville, Tennessee, Louisiana, Texas, Maryland, South Carolina, and Nebraska. A Manual J calculation traverses any City or State boundaries. Your calculations will take into account your home's elevation and the weather attributes of your area. Manual J calculations break down your home into room-by-room heating and cooling requirements. Manual D duct design provides room-by-room detail and can be configured as one line drawings, two line, rectangular or round ducting. You're the Boss! Professional reports will make your inspector smile! Reports certified by ACCA to be Manual J compliant. Equipment selection: You name your brand and we'll do the rest. Properly sized equipment means you pay less in utility bills. Our services are priced affordably. Your hvac contractor has less overhead expenses...lower installation cost? Please note: Designs are only as accurate as the information you provide. Please be as accurate as possible with your home's characteristics when submitting information to us. Note: Currently we are not offering design work in the Radiant or Geothermal fields. Our current designers practical and design experience have all been in the Forced Air fields. We do not believe in claiming expertise in fields where we have no practical experience. Once we have designers on staff capable in these fields, with both field and design experience, we will then offer design work for these areas. STAY TUNED! 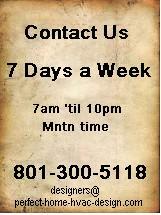 Establish initial contact via following E-mail Form, Information Request Form, or phone 801-300-5118. Send payment with personal or business check, money order, or cashier's check, or we can accept credit cards or other forms of payment via Paypal. American Express payments are accepted only through Paypal. For PayPal payments we will invoice you via e-mail. Your designs are underway! We will contact you quickly for delivery of your finished project.